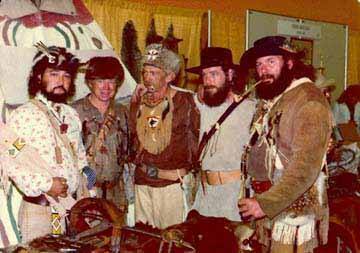 The organization “The American Mountain Men” was started in 1968 by Walt Hayward. Of the original seven members, five; Walt Hayward, Fred Hutto, Ken Smith, Dennis Jackson, Stan McDade, Mark McDade and Brad McDade are still members [Feb 1986]. At this time, the organization was not primitive but rather a modern survival club known as “The Brotherhood of American Mountain Men”, a rather long name for a rather small club, small in numbers, but large in ideals and dreams. The brotherhood had not been in existence long before it became clear to us that we were taking the wrong path, that modern survival concepts could and would only mislead us, that the true survivalists were those we took our name from. This started our study of the history of the Mountain Men, or at least our attempts to study the history and methods of the original Mountain Men. We soon found out that they were the forgotten pioneers of American history. Still we did what we could, picking up bits and pieces here and there. In 1972 it was suggested by Ken Smith that there must be a few others across our nation who held the same interests that we did and that these individuals might be interested in joining with us. By now anything modern was strictly (almost, anyway) forbidden. We were working within the 1820 – 1840 era. We felt this fact alone would keep the number of interested individuals down to a very few if any. At this time, one of the pioneers of modern blackpowder sports was Major Slim Ackerman of New Mexico, who just happened to be writing a weekly blackpowder and related activities article for “Gun Week”. Walt Hayward wrote a letter to Slim, outlining what we were attempting to do and what our ideals and goals were. Slim took the information from this letter and devoted one of his articles to us, giving our address so that any who might be interested could contact us. The few responses we thought we would receive turned into several hundred, enough to keep both Walt and Fred busy three or more hours each night for several weeks. Naturally not all who took the time to write to us were to become members, many wanted another magazine and nothing else, others wanted just another black powder club. These did not fall within our objective and were refused membership. We wanted men who would attempt to embrace the total life style of the original Mountain Men, who would research all they could about these rugged individualists and then go into the field and through practice see if what they were able to find out was even possible. We needed men who would be able and willing to take the time to share their findings with the other brothers through the medium of our magazine, “The Tomahawk & Long Rifle”. There was still much to be done before we could call ourselves a national organization. For practical reasons the name was shortened to “The American Mountain Men”, a symbol was accepted and a rough set of by-laws was written and accepted. This gave us a base to work from and helped to cement our objectives and goals. From this time on growth would be slow but steady, and not without the usual growing pains. We have still not realized our total goals, perhaps we never will, but we will never give up our attempt to do so. We are not a large brotherhood and it is not our desire to ever be so, but rather to remain a small compact group of select brothers working together for a common goal, just as the original American Mountain Men were. The AMM has continued its growth and knowledge through the years. Members have done a considerable amount of research, both academic and “getting on the ground”, to learn the ways of the original mountain men. AMM members have written articles for every one of the eight Book of Buckskinning, a series of books on the history and “how to” of the mountain man. Members have penned innumerable articles for magazines concerned with the mountain men and the fur trade era. Members of the AMM started the Fort Bridger rendezvous, and for the first years, were in charge of this event which has developed into the largest rendezvous in the West. A memorial to “Liver Eating” Johnson was built in Cody, Wyoming by AMM members. The tradition was continued as other notable mountain men were honored at the memorial. Hollywood has noted the skills and knowledge of many AMM members who have appeared in, and acted as technical advisors for many movies (including The Mountain Men, with Charleton Heston and Brian Keith) and numerous television documentaries. AMM members continue their quest for knowledge of primitive skills of the original mountain men and Native Americans. We are happy to share the knowledge that we have gained with those who are interested. This entry was posted in News on August 8, 2017 by mmmuseum.